Question: How can I use cPanel to forward emails sent to addresses in my domain to another email address? 4. 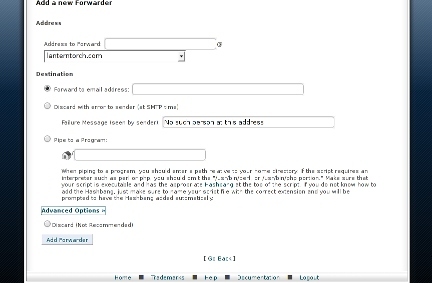 Where it says “Address to Forward” enter the part of the email address that comes before the @ symbol. This should be a prefix that does not already exist as a real email address. 5. In the dropdown menu, select the domain name (if you have more than one). 6. Under “Destination” you can forward emails to an internal or external address, discard and return an error message, or “Pipe to a Program”, meaning that a script will handle the emails. That is all it takes. Now email sent to the address you specified will automatically be forwarded wherever you want.